"Hydroelectric systems quietly operate in personal backyards all over the world. " Fontana Dam and Reservoir, located on the Little Tennessee River and operated by Tennessee Valley Authority (TVA). There are two major environmental issues with Reservoir projects, and it might help to approach them independently. Fish migration heads the list, in part because of the recent addition of salmon to the endangered species list. Retrofitting old dams to provide a suitable migration path is expensive – often hundreds of millions of dollars. Still, when compared to the cost of complete dam removal and the loss of a major source of green power, the one-time cost of salmon mitigation may justify another look. 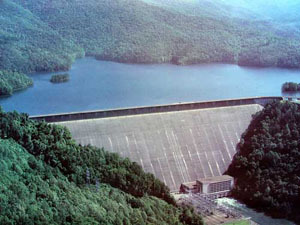 The second issue is the large, manmade lakes behind the dams. Thousands of acres of land lie below these lakes, once a habitat for countless plants, animals, and people. Certainly life is not as it was, yet an entirely new ecosystem has replaced it. These reservoirs teem with wildlife, both underwater and along the shoreline (including a few barely-clothed outdoor enthusiasts). Without question, the ecological impact of a Reservoir hydro system is substantial. Compare it, however, to the alternatives. That body of clean, life-filled water is free of coal mine tailings, oil seepage, and radioactive waste. There are no emissions of mercury, hydrocarbons and CO2. There are no towers and turning rotors dotting the skyline. Except for the dam and power lines emanating from it, the project looks and behaves like a natural lake. And, the energy it produces is relatively cheap. The salmon migration problem must be solved. But many of the other issues associated with existing Reservoir hydroelectric projects should be examined with our other options in mind. This fish ladder bypass allows spawning salmon to access waters above the dam. In contrast to Reservoir hydropower, Streaming hydroelectric projects typically cast a very small ecological footprint – provided good design principles are followed. To begin with, Streaming hydropower projects are usually much smaller. You can easily see a large Reservoir from 30,000 feet, but you might have trouble spotting a Streaming hydropower project from a low-flying helicopter. 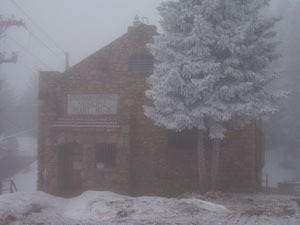 Built in 1925, this one megawatt hydroelectric plant in Colorado generates enough electricity for 800 homes. 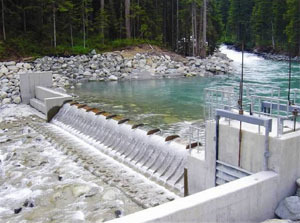 Well-designed Streaming hydropower projects don’t use a dam, which can eliminate the fish barrier associated with Reservoir systems. Instead, a small diversion channels some of the water away from the streambed into a pipeline, where it travels downhill before passing through the turbine and back into its original streambed. The rest of the water continues down the mountain as it always has, providing the same fish migration path they’ve always used. 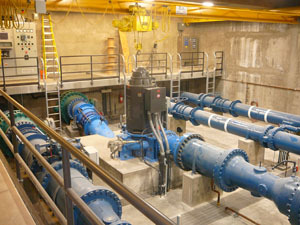 A typical diversion system for a Streaming hydropower plant. 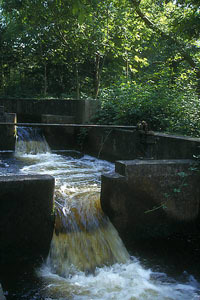 A short spillway ensures an upward path for fish migration. Steep terrain is optimum for Streaming Hydropower systems. Fish migration is often not an issue, since natural barriers like these waterfalls prevent fish from moving further upstream. In many cases fish are not even an issue. Keeping in mind that streams begin in the mountains, there are often natural barriers such as waterfalls that prevent fish from swimming upstream beyond a certain point. It is also this exceptionally steep terrain that works to the advantage of Streaming hydro projects. Without a reservoir, Streaming hydro systems depend solely on the water pressure created by the pipeline. Very steep terrain allows high pressure to be created in short distances, dramatically reducing the cost of the systems. You may, therefore, find diversions in rugged terrain that could block fish passage – if there were fish. In nearly every case, however, you would find some natural barrier below the diversion that prevents fish from ever reaching it. 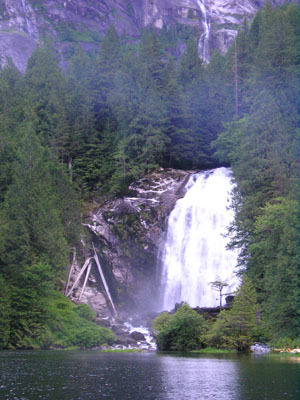 Because Streaming hydro systems are smaller, they produce less electricity per site. But because they can create usable power from much smaller streams, there are many more opportunities to use them. Streaming hydro sites also tend to be located closer to the point of electricity usage, substantially reducing the line losses inherent to large power plant designs. The municipal water supply for Las Vegas includes in-line hydropower generators that convert excess water pressure into electricity with no additional environmental impact. Sometimes Streaming hydropower makes no ecological footprint at all. More and more, municipalities are installing Streaming hydroelectric systems in existing water supply pipelines. 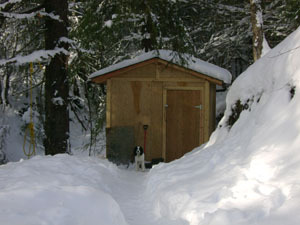 In many cases, municipal water comes directly from lakes or reservoirs at higher elevations. As it comes down the mountain (in the pipeline), the water builds pressure – sometimes so much that special pressure-relieving valves are installed to make sure your faucet doesn’t blow off the wall. Relieving pressure with a valve is a waste of energy, and a small streaming hydro system in its place will produce a continuing supply of electricity with no effect on the environment. We began this section by saying there is no such thing as clean energy, as each source of our power impacts the environment in some way. But some sources of electricity are clearly more ecologically volatile than others. It’s not surprising that most people don’t want a coal-fired or nuclear generating station anywhere close to where they live. It is significant, therefore, that hydroelectric systems quietly operate in personal backyards all over the world. Among our limited choices for electricity, hydropower has one of the smallest ecological footprints – and is among the least expensive – of all our options. We encourage you to take the time to compare. A "backyard" hydroelectric system. This structure contains a hydropower turbine and generator capable of running one or more homes. Thank you for taking the Hydropower Tour! We appreciate your interest in hydropower and hope this tour has been of value to you. If you have questions or comments, please contact us. Be sure to check out the Hydropower Photo Gallery!